Just a review here on my previous post to make it more 'linked" together for easier reference. I previously posted my outlook for KLCI 1H'2012, on Jan 3, 2012. We shall now see how the market has been doing in this 3.5 months time, up to March 15. 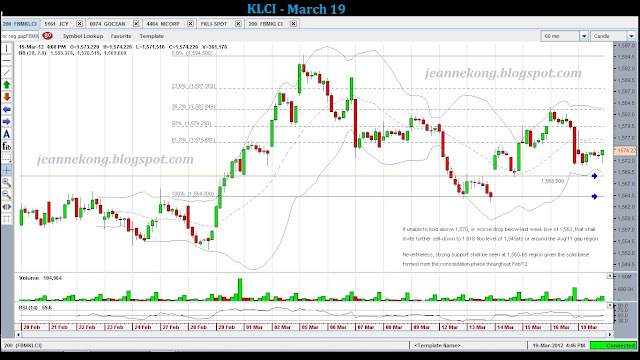 In the first quarter of the new trading year (1Q'2012), we saw KLCI staged a 65-pts run from1,530 (Dec 30, 2011) to 1,595 (March 5). The index consolidated within the 1,510-1,530 range throughout Jan'12, before successfully broke out of the consolidation phase on Feb 2, & made a 35-pts run from 1,530-1,565 points within 1 week's time (Feb 2-9). After that, as mentioned on Jan 3 post, the index found rigid resistance from 1,560-1,565 level & got rejected from there several times throughout the month. On Feb 29, a breakout from the consolidation phase see the index fly another 20-30 points before finding resistance again near the Jul'11 peak of 1,597pts, thus dropping back to find support again at 1,565pts. Below is the Jan 3 chart, followed by the KLCI chart as at March 15, 2012. Managed to capture today's index movement as below. 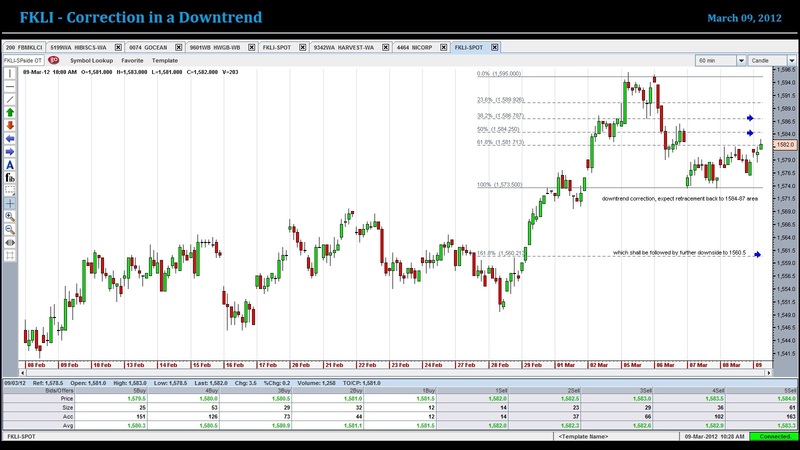 We see some very mild rebound from last week's close of 1,571pt. This is not a good sign especially with RSI also hovering below 50. Based on today's performance, I think there will be more downside to the index, sooner than expected, if it does not hold above the 1,565-1,570pts. Fibo projection gives a further 20pts downside from if break below 1,564pts, leaving the next support for the index around 1,545pts, which was the upper-side of the infamous Aug'11 plunge gap. 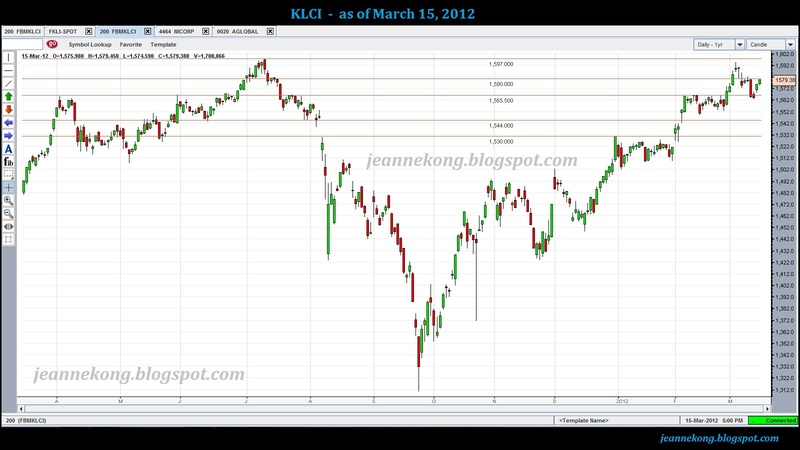 However, we should see rather strong support at 1,565 level given the month-long consolidation base formed throughout Feb'12. 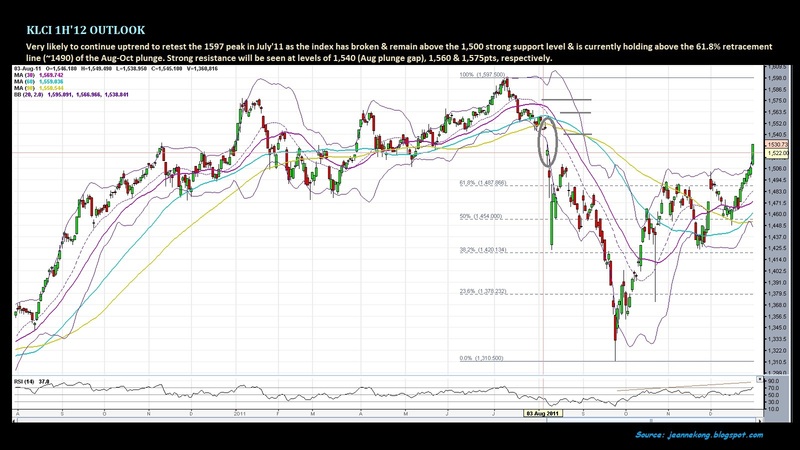 On March 9, I spotted a RISING WEDGE pattern in formation, giving a turnaround point around 1584.5-1587 region, followed by projected downside breakout target to 1,560 level. 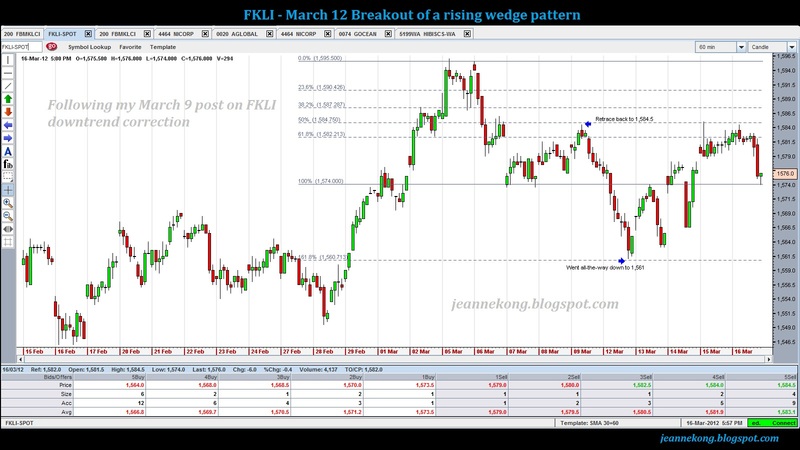 This was all done right after my post, we saw FKLI touch 1584.5 & turnaround on the 11am candle, all the way down to close at 1576 point on March 9. The next Monday (March 12), the futures index opened lower & free fall all the way to the lowest point of 1,561, before rebounded slightly to close at 1,565pt. 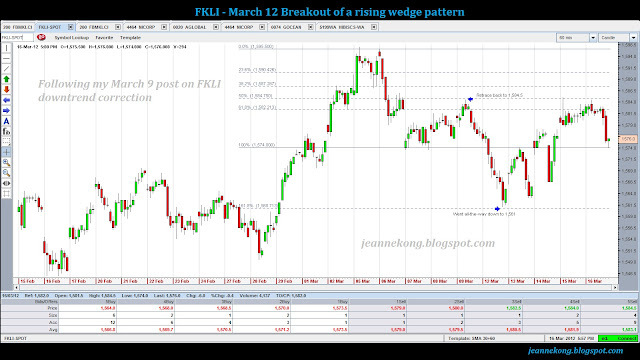 FKLI - Completion of a Rising Wedge breakout on March 12. The FKLI should move more or less in tandem with the index. I shall write on it in another post if there's any big movement within this week. Need to get away from my laptop now, not feeling well today.